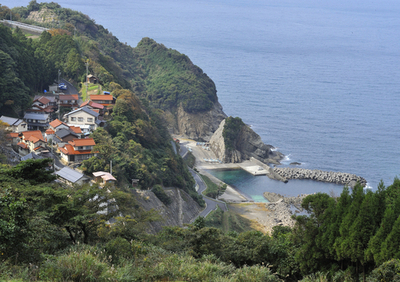 Unfortunately ‘Tada-Ura’ can’t be seen in the report on the coastal area in Tatenui Province in the Fudoki, however there is mention of ‘Tata Yashiro’ in the paragraph on the shrine. 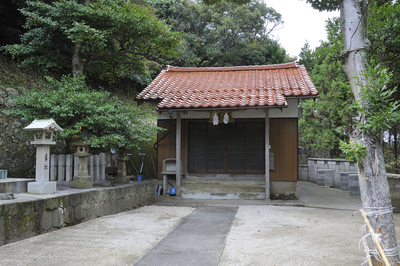 The current ‘Tata-jinja’ is probably connected to the former shrine, ‘Miho Daimyoujin’. In the early Edo Period publication ‘Izumo Fudoki Shou’ by Kishizaki Tokiteru, there is reference to a ‘Tatenui-gun Tada-ura Daimyoujin’ from which we can surmise that ‘Tada’ is a name leftover from ancient times. However, the ‘Unyoushi’ published around the mid-Edo Period mistakes the ‘Tata’ name in its report ‘Miho Myoujin, enshrined deity Mihotsu hime-no-mikoto’. No main shrine, ‘Heihaku Shinto offering’. This is the only account showing us that the Main Shrine had already gone. The publication the ‘Izumo Sanpai-ki’ from the late Edo Period also reports ‘No shrine now’. It would seem the religious activities at the time went on in very austere conditions. Omura Washiro who worshipped at the shrine in 1866, noted ‘Stone fence around the shrine, sacred tree present’. On a pleasant morning on December 27th 1912, a group of 26 fishing boats set off early on the calm seas from Shiotsu Bay. However at 10 a.m., a sudden huge wave rose up rendering visibility to zero. Nine of the boats couldn’t make it back to the harbor so Shiotsu-ura asked Tada-ura for assistance. At first it seemed like the rescue had been a success but following news that three boats remained unaccounted for, a group of 15 youths set off for a second time from Tada Bay at 2.40 p.m.to help with the search and rescue. They were never to return. At that time, teacher Ichiro Izumi Hayashi had been instructing the youths about Sea Rescue techniques at night school. He felt a deep responsibility and took it on himself to organize a large memorial which was unveiled in the August of the 4th year of Taisho. A large rock face in Tada Bay was engraved with the characters meaning ‘Heroism’. On the 100th anniversary of the disaster in October of Heisei 23 (2011), an additional plaque detailing the fateful events was revealed in honor of the dead during an auspicious ceremony attended by numerous local and prefectural politicians. While the loss of 15 young lives all at once is truly heartbreaking, through this tragedy, we are able to feel the sense of selflessness of those in the Meiji/Taisho era determined to fulfill their responsibilities even in the face of adversity.